Not to be confused with the service that inspired it (beyond sharing a name), Napster.fm is an open source, social music service that syncs and plays your music on any system anywhere. You can even get friends together and play for a crowd. The tabs across the top of the page will guide you to new music if you don't have something you want to search for and hear immediately. Discovery will show you what other users have played recently. Once you've made some friends on the service, Hot List is something of a Billboard chart of music played by your friends. As you search for and play new songs, they're automatically added to your library. You can listen privately, or if you want to get friends involved, you can type in other usernames in the "Sync With" field and play for all of them at once. 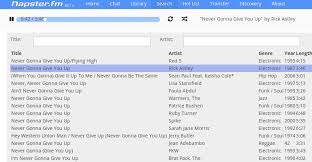 At its core, Napster.fm is a front-end webapp (no desktop or mobile apps yet) for YouTube that pulls in mp3 audio, so in that way it's not unlike other "search and play whatever you want" services out there. Where it excels is in the fact that it's fast, lightweight, and, if you choose, you can download the source (hosted at GitHub) and run the service on your own server, playing music for your friends and organizing your own playlists without depending on a web service (or getting sad if it shuts down on you or gets sued into oblivion).